Most human beings enjoy and thrive off of the company of others. Sometimes, being alone for an extended period is a part of life. Living Full Out is about making you feel positive and enjoying every moment. And that can be slightly challenging when we don’t have the people we love surrounding us. Perhaps we’ve moved to a new city where we don’t know anyone; maybe people have left us. But being alone doesn’t mean we can’t make the most of our time and be productive. Moving to a brand-new city, miles away from home can be exciting but also incredibly intimidating, especially if you don’t know anybody. 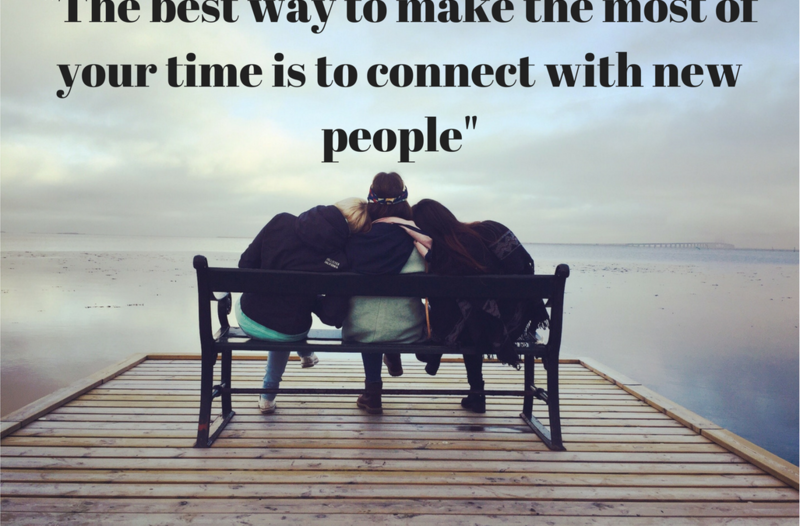 The best way to make the most of your time is to connect with new people. If you’re in school, there are plenty of on-campus events and groups you can join, like a sports team or a theatre troupe. Figure out your interests to find like-minded people. Nothing brings people closer than having a mutual passion; this could even be the perfect opportunity to try something new. If there is no such group for that on-campus or if you’re not in school, your local community most likely will have something of the sort. One much-used resource is www.meetup.com, where several groups exist ranging from networking to playful activities like happy hours and sports. You can actively participate in the group and do fun activities, like movie screenings and themed parties. Join a dating site like Tinder, if you’re single and looking for someone to explore the city with or show you around. Do you know someone who knows someone in your new town? Send them a message through Facebook, stating you have a mutual friend and you wanted to see the city. It’s possible they can show you around town or introduce you to their group of friends. Search for public events on the internet and show up to them. Casually introduce yourself and start making connections. Join a local group that specializes in showing new people, like international students, around. You can often find these groups at your local university or church, under the activities section. You can always call and ask. They plan lots of fun activities together, like shopping trips and touring the city. You just may meet a new friend through it. Many times, they invite their international friends over for Christmas or Thanksgiving dinner. If you’re alone during this time, perhaps hit up a friend and see if you’d be welcome to celebrate the holiday with them and their family. It can be difficult when the people you care about leave you. Doing these activities by yourself when you once had a group of friends can bring back memories making you discouraged and reminiscent. Perhaps try a new activity in your hometown that can spark a new sense of excitement. Do things you typically wouldn’t otherwise have time for, like going to the gym, catching up on sleep or that show on Netflix you’ve been waiting to binge-watch. Try a new project, like writing a book or painting. Who knows where your brand-new passion will take you and what recognition it can bring? Try and focus on the positive. If you’re on vacation, explore a new city or country on your own. Sure, you may have to eat alone, but you can do and see whatever you want. You don’t have to consider anybody else, listen to your intuition. There is nothing wrong with trying different groups out as you try to find your group of friends. Invest in activities to better yourself and pull yourself ahead, such as making more money on the side or creating a new hobby. Being alone doesn’t mean you have to be lonely. Be productive by Living Full Out!